The Ruth Ellen Steinman Bloustein and Edward J. Bloustein Memorial Lecture was established to honor the memory of these two extraordinary individuals. For nearly nineteen years, the Blousteins dedicated their enormous energies to Rutgers, The State University of New Jersey. The fund was established in 1988 after Ruth Ellen died following a long and heroic battle with illness. 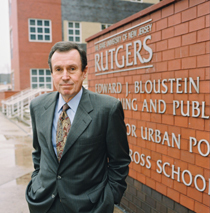 Sadly, there was cause to broaden the purpose of the fund a year later when Edward Bloustein, Rutgers’ beloved president, died suddenly in December of 1989. The endowment supports an annual lecture series, that may include one to three lectures per academic year, that is intended to celebrate the values and interests Ruth Ellen and Ed cherished and cultivated throughout their lives. The Ruth Ellen Steinman Bloustein and Edward J. Bloustein Memorial Lecture series focuses on three main themes. One area of exploration is the study and preservation of animal species and the natural environment. A second theme celebrates love, happiness, and laughter as tools of clinical medicine. The third topic seeks to explore and promote humane values, which Ed Bloustein believed were woven in the fabric of Judaic tradition and passed down from generation to generation. 2018—(panel on women’s leadership and entrepreneurship)—Christiana R. Foglio, MCRP ’86 (GSNB), DC ‘84, President, Community Investment Strategies, Inc.; Courtenay D. Mercer, MCRP ’02, Principal, Mercer Planning Associates; Jessica Schellack, MCRP ’11, Co-founder, OQ Coffee Co. The Robert A. Catlin Memorial Lecture honors the legacy of Robert A. Catlin, Bloustein School professor, who died in July 2004. Catlin began his career as a staff planner for governmental agencies and community organizations in several cities, including Los Angeles, Washington, D.C., and New York. He also served as dean of the College of Social Science at Florida Atlantic University, dean of the Camden College of Arts and Sciences at Rutgers, and provost and vice president for academic affairs at California State University, Bakersfield. He was inducted as an AICP Fellow in 2001. At the Bloustein School, he specialized in urban revitalization and the impact of race in public policy decision-making. Themes: urban revitalilzation, planning, race issues in public policy decision making. In partnership with the offices of Florio, Perrucci, Steinhardt, & Fader LLC, in 2015 the Bloustein School recognized Gov. Florio’s public service career through the endowment of a high-level visiting scholar. The annual Governor James J. Florio Distinguished Visiting Scholar of Public Policy will be a former senior government official or policy practitioner, focusing on an issue that was central to his legislative and gubernatorial career. The scholar will meet and interact with Bloustein School graduate and undergraduate students and faculty and will also present a featured public lecture at the school. The Stuart Meck Distinguished Speaker Series on Land Use Law and Affordable Housing was endowed by the late Stuart Meck, an Associate Research Professor and director of the Center for Planning Practice at the Edward J. Bloustein School of Planning and Public Policy, and established by his family in 2018. Stuart Meck was a renowned specialist in land use controls and reform with 45 years of experience in planning, research and municipal administration. He is considered a pioneer of smart growth with its emphasis on compact development, natural resource protection and affordable housing. Two major works remain in publication, “Growing Smart Legislative Guidebook: Model Statutes for Planning and Management of Change” and, “Ohio Planning and Zoning Law”, co-authored with Kenneth Pearlman. From 1989 to 1991, Stuart served as the president of the American Planning Association. Stuart consulted to the U.S. Department of Housing and Urban Development, the Fannie Mae Foundation, the Lincoln Institute of Land Policy and various local, state and international jurisdictions. Stuart’s writing demonstrated the ability to take complicated legal concepts and translate them into language that non-lawyers could understand. He was an outstanding teacher owing to this same ability and willingness to sit with students to explain the intricacies of planning issues to them. The Stuart Meck Memorial lecture selects speakers who rank among contemporary practitioners of planning and policy development from within or outside of New Jersey. This series further strives represent the diversity of opinions and positions currently under public and academic debate. The Isadore Candeub Memorial Lecture in Planning was established in 1987 by his family, professional colleagues, and friends, and is presented each year as a lasting tribute to Isadore Candeub in recognition of his many achievements in, and contributions to, the field of planning. 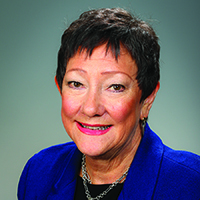 The series was organized by the Edward J. Bloustein School of Planning and Public Policy. In 2018, the lecture series became the Isadore Candeub Endowed Graduate Fellowship in Planning, which provides an annual award of $2,500 to a full-time graduate student based on academic merit and financial need and with preference for a student(s) in the design and development/redevelopment concentration. Isadore Candeub, MIT ’48, was a leader in the field of urban planning and redevelopment from 1953, when he founded the firm later known as Candeub, Fleissig & Associates, to 1986, the year of his passing. As president of CF&A, he directed the preparation of planning studies for towns and cities across the nation and internationally. Headquartered originally in Newark, NJ, the company expanded and at one time was the largest organization in redevelopment planning in this country. It was noted for its high standards and excellence in professional staff, many of whom were graduates of the Rutgers planning program. The annual Isadore Candeub Memorial Lecture was established in the memory of Isadore Candeub in tribute to his long and successful career as a planning consultant and to his extraordinary dedication to planning in towns, cities and regions across America. Before his passing in 1986 he was chairman of the executive committee of Candeub, Fleissig & Associates, consultants in community development and environmental planning. Mr. Candeub, with Morris B. Fleissig, a lawyer, founded the firm in Newark in 1953. Earlier he had spent 20 months in the Federal Government as chief planner for the Northeastern region of the Housing and Home Finance Agency, precursor of the Department of Housing and Urban Development. He was a 1943 graduate of the City College of New York; did graduate work at Columbia University and received a master’s degree in 1948 from the School of Architecture and City Planning of the Massachusetts Institute of Technology. Fall 2017 (panel discussion on the history and evolution of Metuchen, NJ) Anton Nelessen, professor, Bloustein School and former Town Planner, Borough of Metuchen; James Constantine, Principal, Looney Ricks Kiss and Town Planner, Borough of Metuchen; Len Roseman, Chair, Metuchen Borough Parking Authority; James B. Graziano, Partner, Graziano, Piasecki, Whitelaw & Simko and former Attorney, Metuchen Borough Parking Authority; John Wiley, former Mayor of Metuchen; Jay Muldoon, former Metuchen Councilman and Acting Borough Administrator; Stephen A. Santola, Woodmont Properties; Joel Schwartz, Landmark Companies LLC; and Eric Berger, US Real Estate.